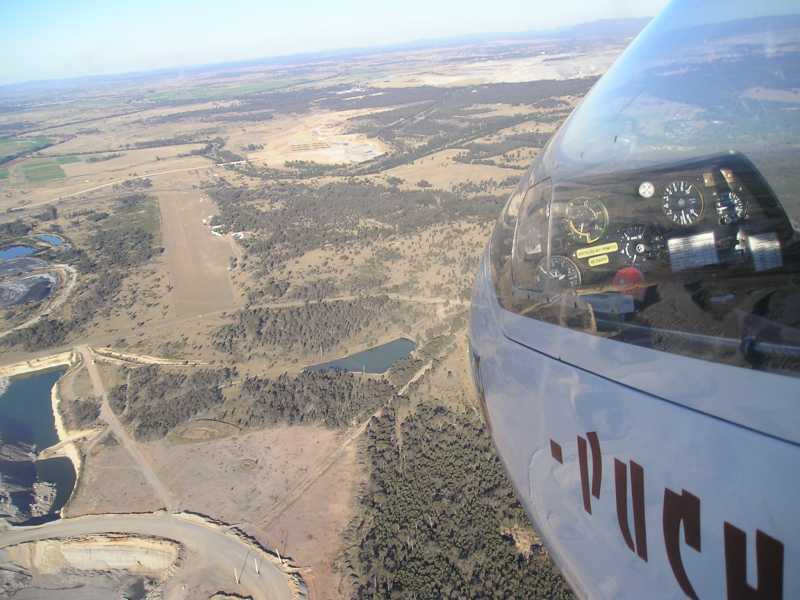 The Hunter Valley Gliding Club offers air experience flights and introductory packages to anyone who is interested in learning more about soaring. In each case, for legal reasons, you will be required to take out a membership of the Gliding Federation of Australia (GFA). This is arranged before your first flight and the cost is included in the price of the offer that you are taking. 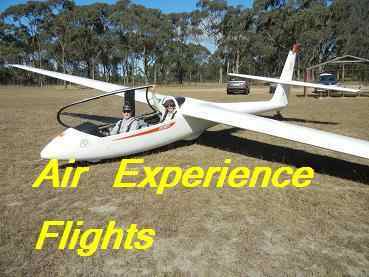 Air Experience Flights are intended for your first experience of flight in a glider. The gliders are certified for a maximum passenger weight of 110kg. This cannot be exceeded, even by 1kg. There is also a minimum weight but we have extra ballast weights to make up the difference as long as you weigh at least 55kg. If you weigh less than 55kg you will be required to sit in the back seat Please do not be offended if the instructor asks you how much you weigh. Other than weight, if you can fit comfortably into the glider you can fly in it. Please wear secure shoes; not thongs. You will need a hat and sunscreen, even on a cloudy day. The best kind of hat is one with a soft brim that goes all the way around to cover your ears and the back of your neck. A baseball hat is only just better than nothing. Ladies, you may find it awkward if you wear a tight or long skirt. The glider cockpit is quite warm so you don't need warm clothing. The club cannot accept credit cards on site, so please bring cash with you or purchase a gift voucher on line. A standard air experience flight lasts approximately 20 minutes and an extended air experience flight lasts approximately 30 minutes, depending on conditions in each case. The flight will be under the command of a GFA rated gliding instructor so you will be permitted and indeed encouraged to have a go on the controls yourself during your flight or flights. It is a tremendous experience to be able to ascend using only the energy in the air without the noise and fumes of an engine. You will fly in one of our two-seater gliders. The instructor sits in the back and you get the front seat. Both seats have a full set of flight controls so the instructor is in complete command of the flight at all times. You get a better view from the front seat and this is the seat you will sit in if you continue your gliding experience and eventually fly solo. During your flight you will fly over coal mines, lush dairy farms and vineyards with the mountains of the Wollemi and Barrington Tops National Parks on the horizon. When you have completed your flights your are of course free to take out additional longer term membership of the Gliding Federation and the club to continue your flying training. We also offer 3 flight and 10 flight introductory packages. The 3 flight package includes Introductory Membership of GFA which is valid for 9 days and provides the first three flights in the flight training sequence. You will normally take all 3 flights on the same day provided the conditions allow it. The 10 flight package includes 3 months membership of GFA and of the club as well as a log book. Air experience flights and introductory packages can be purchased either via a gift voucher or by paying cash on the day you fly. (Our price list). We fly every weekend and public holiday, weather permitting and air experience flights are available on most days on which we fly however, as these flights require the services of a qualified gliding instructor, it is worth checking the roster to make sure that an instructor will be available on the day you plan to visit. There are some days when no instructor is rostered for duty - such days are shown in the roster as "Independent ops only". We prefer to fly on sunny days but will fly in any weather conditions so long as it's not raining. If you arrive between 11:00am and 3:00pm you should get a flight but we cannot guarantee a specific time. Certainly, arriving before midday is preferred. If you require any more information or would like to talk to a member of the club please email us or call any of the members listed on our contact page.